Other Products: Mowed Lawn and Picked Raspberry Distress ink, Versamark ink, Ranger Silver Embossing powder, Transparent and Pink Glitter, Gansai Tambi Watercolors, Koi Watrbrush, Watercolor cardstock and pearls. Instructions: Die cut the bottom of 6" x 6" piece of white cardstock using the die from Ornate Pocket Accents Die. Trim the edges so that the height of the remaining piece is 5 3/4" and the top width is 5". Score this piece at 1/2" from the top. Take a 5 3/4" x 5 3/4" pattern paper from Sweet Peony Paper Collection and make a 5" wide slit 1/4" from the top. Insert and glue the 1/2" tab from the previous step inside this slit. Adhere this piece to a 6" x 6" piece of white cardstock. 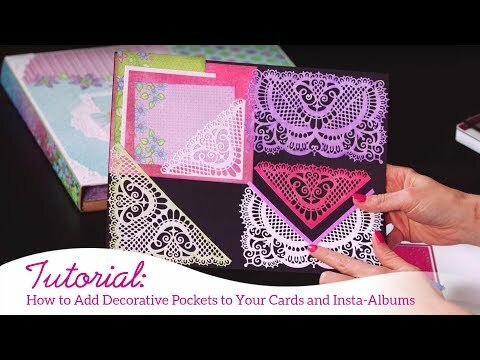 Decorate the top of the die cut piece using the same paper collection and Ornate Pocket Accents Die. Stamp the flowers from Buttons and Blooms Cling Stamp Set using Versamark Ink on watercolor cardstock and heat emboss them using Heat It Craft Tool and White Embossing Powder. Color them using Koi Waterbrush and orange and green colors from Gansai Tambi Watercolors. Die cut them using matching dies from Buttons and Blooms Die. Shape all the flowers using Deluxe Flower Shaping Kit. Add Hot Mama Prills to the flower centers. Use the green flower petals as leaves. Stamp the Decorative Vase stamp from Merry and Bright Accents Cling Stamp Set using Versamark Ink on white cardstock and heat emboss them using Heat It Craft Tool and Ranger Silver Embossing powder. Cut off the leg of the vase and adhere it to the left side of the die cut flap. Arrange and adhere all the flowers and leaves as shown inside the vase. Stamp the corset image from Floral Corset Cling Stamp Set using Versamark Ink on watercolor cardstock and heat emboss them using Heat It Craft Tool and Gold Embossing Powder. Color it with Picked Raspberry Distress ink using Stack and Store Daubers and Koi Waterbrush. Die cut it using matching die from Floral Corset Die. Apply glitter to few parts of the corset. Curve and shape it slightly. Die cut the leaf swirl from white cardstock using the die from Cut Mat Create 2A Die. Ink it with Mowed Lawn Distress ink using Stack and Store Daubers. Shape it using Deluxe Flower Shaping Kit. Cut it strategically and adhere behind the corset die cut we made in last step. Adhere the pinished piece to the card front as shown. Glue some pearls to the die cut to add finishing touch.